In order to retain remarkable position in this industry, we are providing a wide array of Granite Stone Elephant. this is agranite ganesha statue with grey finishing.the statue is 15 inch height with excellent craft work. This statue can be given after 15 days of order confirmation. Owing to our in-depth knowledge of this domain, we are specialized in providing Granite Parvati Statue. Clients can avail an astonishing range of buddha sitting granite statues. Our product range fabricated from high grade sand stone sourced from our reliable vendors in the market. These products are provided in different designs and patterns and are valued for high quality standards and durability. Clients can avail these products at industry leading prices. Dexterously crafted, our variety of crown buddha bust black granite statue looks astonishing and is perfect for decoration. Our craftsmen manufacture this statue using premium quality black granite and other material. Offering black granite dolphins sculpture is available in all sizes. We are indulged in offering the finest quality Granite Buddha Statue. 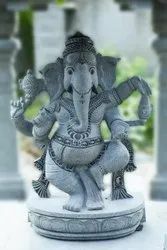 We are engaged in providing a wide range of Granite Ganesha Statue to our clients. 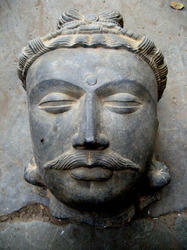 We offer Black Granite Statues of Lord Vishnu. These statues are made for positioning in the gardens and crafted by our South Indian artists using latest techniques. With the hammer and chisel, we get the desired shape and finish in the statue.